Not so much about the object as it is about the camera. A laptop was chosen as the subject of the video just because it was portable and readily available. The image on an infrared camera can be customized in more ways than one. For example, the temperature range can be changed to make minor temperature changes appear more pronounced, or the other way around. 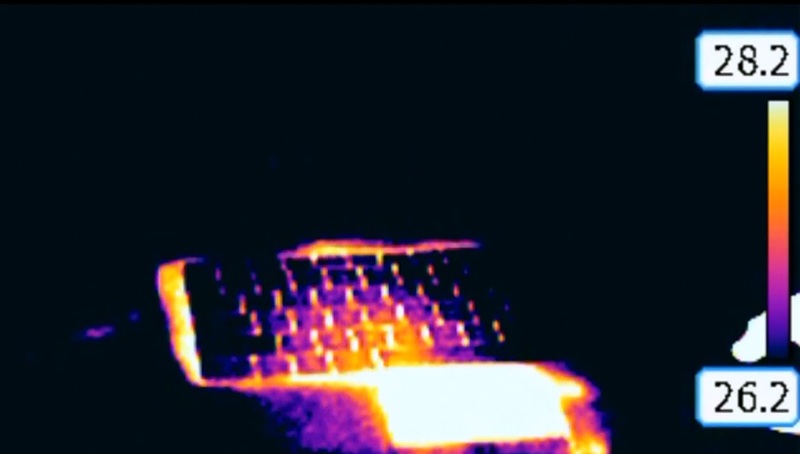 This is a video of a laptop with the temperature range tightened, initially, and then widened. When the range is very tight, everything sort of blends together, and there appears to be a lot of noise. Once it's widened, the background shows up a bit better and more details are visible. Not much actually happens in reality aside from settings on the camera being changes. The laptop had been on for a while and doing stuff. The square at the front of the laptop is a touchpad.